On Sale Now! 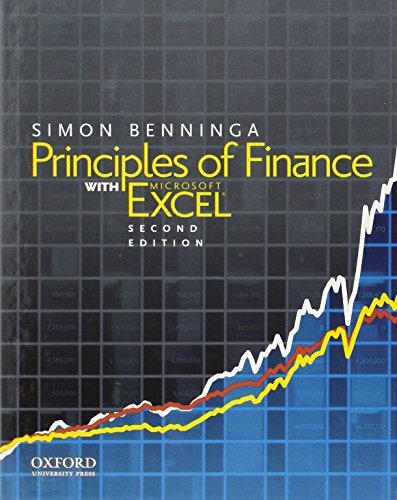 Save 3% on the Principles of Finance with Excel by imusti at Translate This Website. Hurry! Limited time offer. Offer valid only while supplies last. Finance is a topic that requires much computation, and in today's business world that computation is done almost entirely using Excel software. Finance is a topic that requires much computation, and in today's business world that computation is done almost entirely using Excel software. Despite this, existing finance textbooks continue to rely heavily on hand calculators. Business school students--whose background in Excel software is often weak when they come into finance courses--find that when they leave the academic environment they have to relearn both finance and the software. Addressing this issue, Principles of Finance with Excel is the only introductory finance text that comprehensively integrates the program into the teaching and practice of finance. Offering exceptional resources for students and instructors, the book combines classroom-tested pedagogy with the powerful functions of Excel software. Author Simon Benninga--one of the most recognized names in financial modeling--shows students how spreadsheets provide new and deeper insights into financial decision making. The second edition of Principles of Finance with Excel covers the same topics as standard financial textbooks--including portfolios, capital asset pricing models, stock and bond valuation, capital structure and dividend policy, and option pricing--and can therefore be used in any introductory course. However, it also introduces Excel software as it applies to finance students and practitioners. Throughout the book, the implementation of finance concepts with Excel software is demonstrated and explained. A separate section of PFE provides thorough coverage of all Excel software topics used in the book: graphs, function data tables, dates, Goal Seek, and Solver.